The Core Values of Saint Mary’s College are a set of four principles that guide the College’s everyday practices. The first two principles, learning and community, describe the College’s commitment to education and lifelong learning, and creating an environment where individuals feel respected and empowered. One of the goals of a Saint Mary’s graduate education is to take the skills and knowledge gained in coursework and apply those abilities to lead change and transform people’s lives. One student from the Data Science master’s program embodies those two values, and began using his education to help those around the world before even finishing his degree. Masa Gumiro left his home country of Zimbabwe at the age of 18. He was awarded a scholarship in an exchange program at Jacksonville State University in Alabama, where he studied computer science and mathematics. After graduating with his bachelor’s degree, Gumiro began his career in technology as a software engineer. 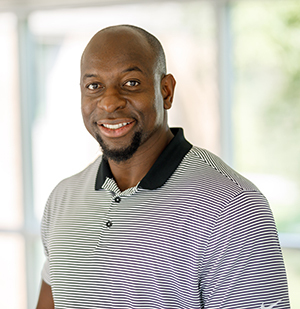 He now works as a senior business intelligence consultant for the U.S. Army, and lives in Texas with his wife and two children. Even as he worked fulltime, Gumiro never lost his appreciation and excitement for education. He continued to take online courses that advanced his understanding of computer programming; however, in 2015, he struggled to find a course that would teach him about ‘big data.’ This new term interested Gumiro, and he began researching graduate programs that offered degrees in data science. After applying to three schools and being accepted to each program, Gumiro chose Saint Mary’s. In March 2018, Gumiro, his mentor Leo Manhanga, and two other Zimbabwe-born colleagues traveled to back to their homeland to present innovative technologies to the nation’s new government and business community. They hosted a three to four hour workshop, where they used an artificial intelligence robot to demonstrate how technology is used in America and presented how data can be utilized to manage companies and government offices. The demonstration impressed the almost 70 representatives in attendance, so much so that companies approached Gumiro and his colleagues immediately after the workshop to ask how technology can improve the way they do business. Since his trip to Zimbabwe, Gumiro, along with Manhanga, have begun exploring technology projects with the Zimbabwe government and one of the largest privately owned beverage distributor in that country. News of the successful workshop has also spread to other countries; the two men have had requests for their services from organizations in Botswana, Kenya, Ethiopia, the Bahamas, and from an organization subcontracted by The World Bank. Gumiro is also working on forming a partnership with tertiary institutions in Zimbabwe to teach data science and cutting edge technology courses. “This has been an eye opening experience. Right now Africa is years behind America with technology. I hope to take what I’ve learned at Saint Mary’s and bring Zimbabwe into the twenty-first century,” Gumiro said. Gumiro attributes his success to the education he received in the master’s program at Saint Mary’s. He described the Data Science program as challenging and demanding, but said the top notch, well rounded curriculum makes this a stand out program. Gumiro also noted the faculty are experts in their fields and have continued to encourage and support him throughout this exciting journey. 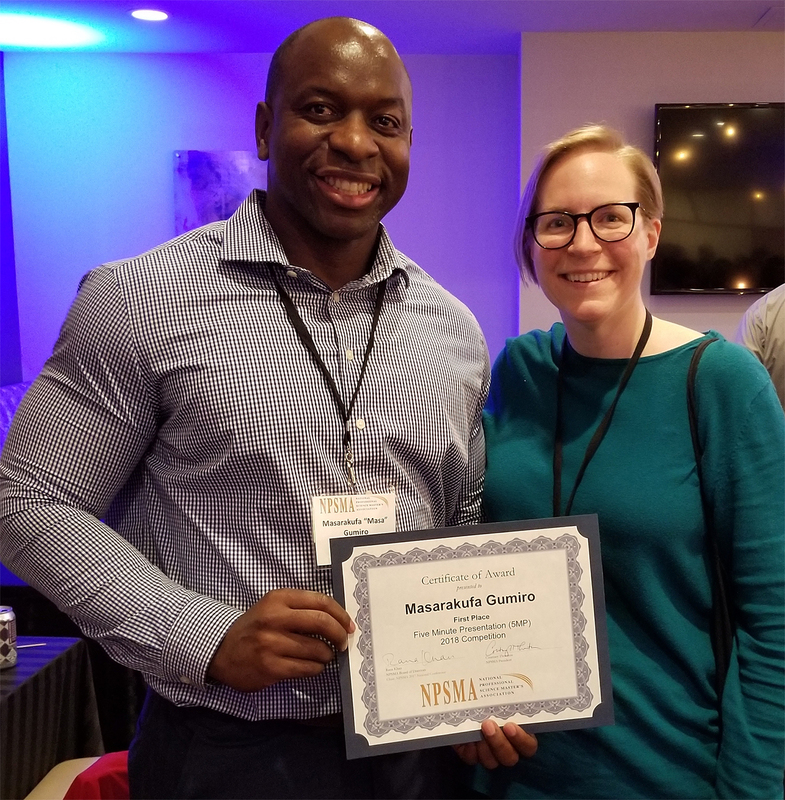 On November 8, Masa competed in the Five Minute Student Project Presentation at the National Professional Science Master's Association's annual conference in Washington D.C. The presentation provides students in Professional Science Master's programs with an opportunity to explain their capstone projects in a face-to-face presentation using non-technical language to an audience in a total of five minutes. Masa won first place and his success has helped him garner financial support for his future projects and initiatives. Even though he will graduate in May 2019, Masa has no intention of slowing down. He is currently balancing his job with the Army, side projects, and spending time with his family. Gumiro and Manhanga also began a startup company and they will officially launch in the next few months. He is applying to PhD programs focusing on technology project management and hopes to start August 2019, and is enrolled in another online course where he is specializing in the Internet of Things (IoT). Learn more about Saint Mary's Data Science program.